There’s a lesson in here for anyone planning to visit a cemetery to find where their ancestors are buried. I wish I’d had this lesson before traveling to Germany. 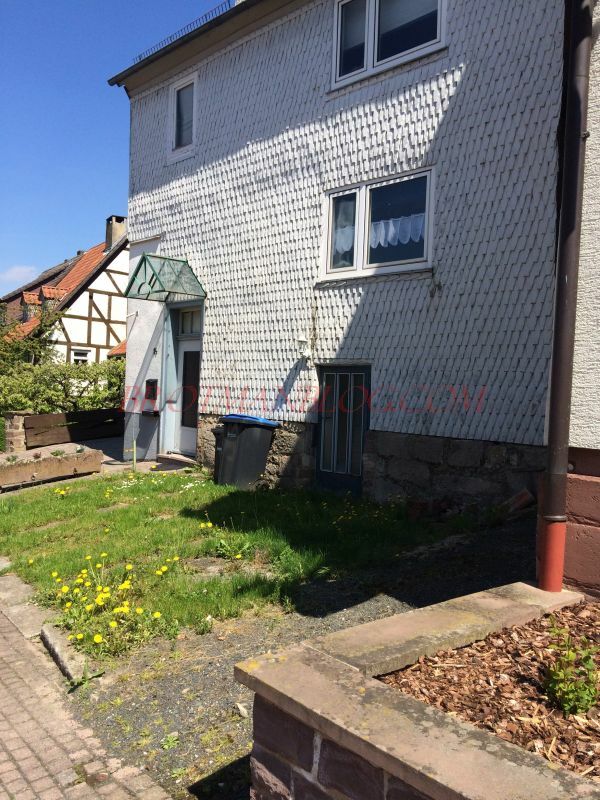 May 10 was our last day in the Kassel region, and we were going to see the village of Jesberg, home of the Katz and Katzenstein families. As the Katzenstein/Katz family has been the one I have been researching most recently, these names and stories were freshest in my mind, and I was very interested in seeing what we could find and learn. Hans-Peter Klein was again going to be our guide along with Mrs. Ochs, who lives in Jesberg. 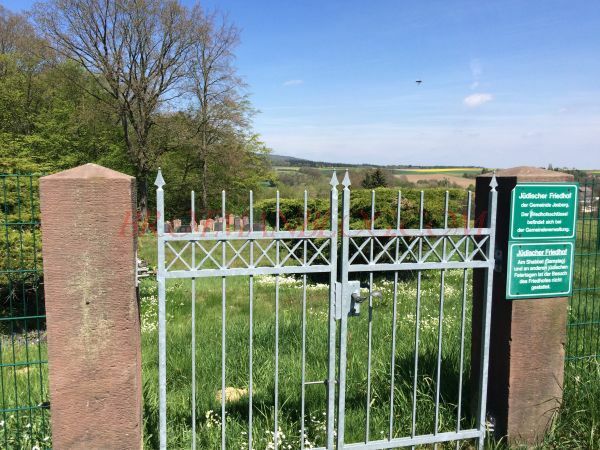 We followed Hans-Peter from Kassel to Borken, where he picked up the key to the cemetery in Haarhausen where the Katzenstein and Katz family members from Jesberg were buried before the Jesberg cemetery itself was established. As with the Obervonschutzen cemetery near Gudensberg the night before, I had no idea what to expect in Haarhausen. I did like the horses who were grazing nearby. This was another very big cemetery with close to 400 stones dating back to 1705. 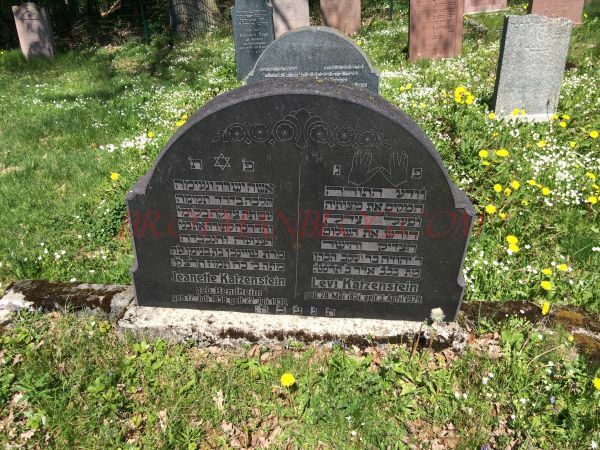 Once again, Hans-Peter came equipped with a map and pages from the LAGIS website showing the headstones and information about many members of the Katz and Katzenstein families who were buried at this cemetery. So we were off on another treasure hunt—but with better lighting and more rested eyes than the evening before. And what treasure we found. I have to admit that I should have been better prepared for this visit. I should have searched the LAGIS website myself before leaving home and written down all the Katzensteins who were buried there, where they were buried, and how they were related to me. But I failed to do that. I am not sure I even knew about that part of the LAGIS website, or I’d forgotten about it. It would have made my search both easier and more meaningful if I’d been better prepared. 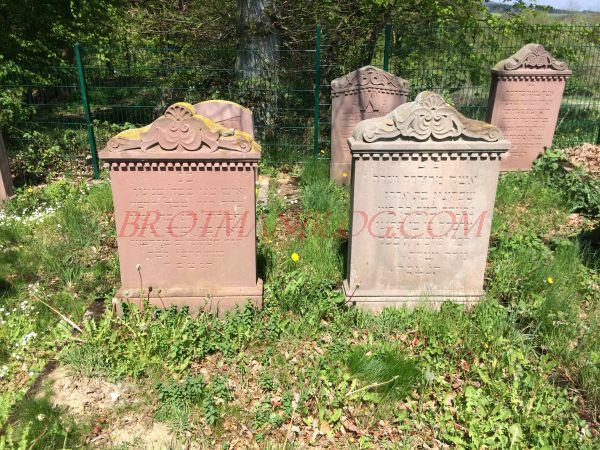 I thought that these were the headstones of my three-times great-grandparents Scholum Katzenstein and Breine Blumenfeld because, looking quickly, they matched the pages for a Schalum and a Brendelchen. 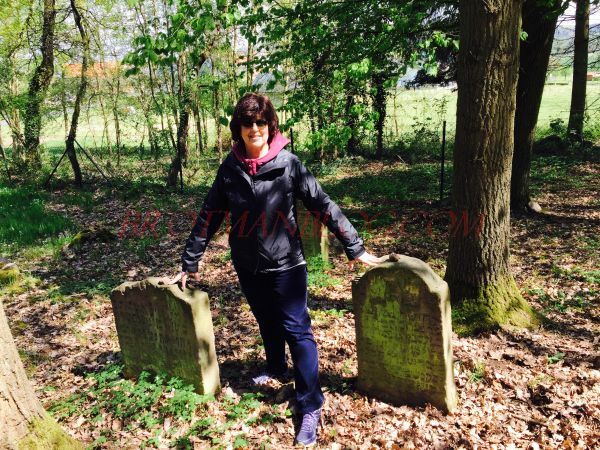 I placed stones and even took a picture with both stones, believing these were the parents of my great-great-grandfather Gerson Katzenstein. 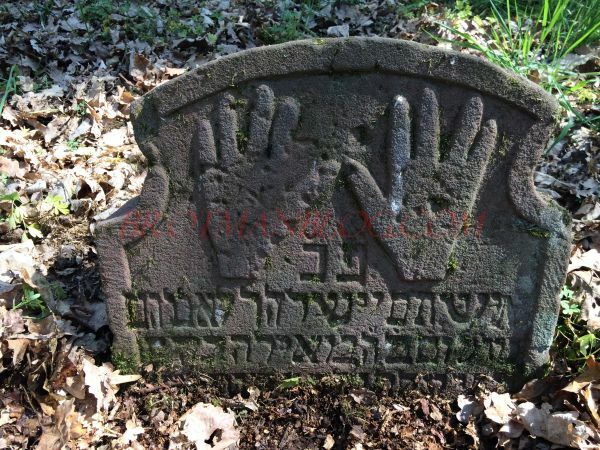 In fact, having now had the chance to sit and check my tree and the LAGIS pages and the photos, I know that these were the stones of my FIVE-times great-grandparents, Schalum, son of Pinchas ha-Cohen, and his wife Brendelchen (father’s name unknown) who died in 1774 and 1776, respectively. They were the grandparents of Scholum Katzenstein, great-grandparents of Gerson. Wow. Do I wish I had known? Yes. Does it really matter? Probably not. I paid tribute, I visited. I just thought they were different people. I am, however, really sorry I could not find the stone for Meir, the son of Schalum ha Cohen and Brendelchen, who is buried at Haarhausen. He was my four-times great-grandfather, the father of Scholum Katzenstein. There were many stones that were similar to this one depicted on the LAGIS website. But I could not find Meir’s stone. 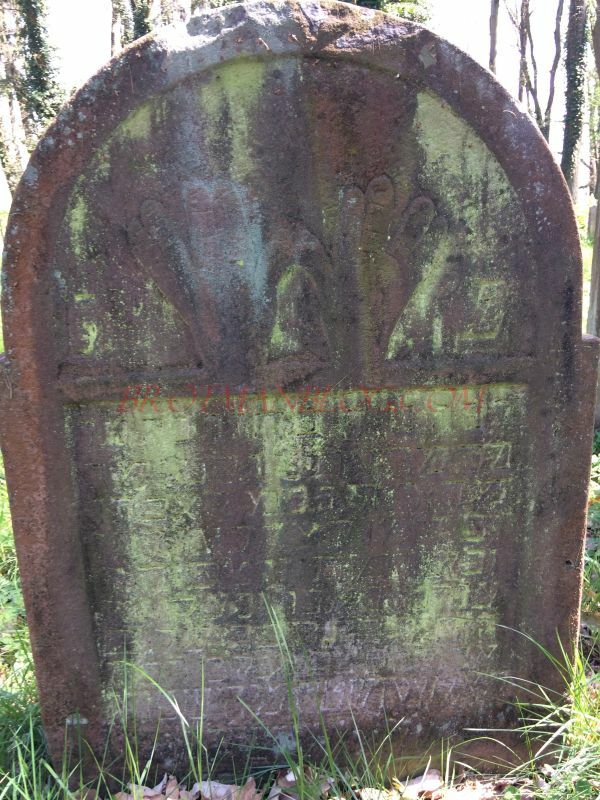 I did, however, find the stone for his wife, Henchen, who was my four-times great-grandmother. But I did not realize this was who she was at the time, only when I got home and checked my resources. I assume that Meir’s stone was nearby. 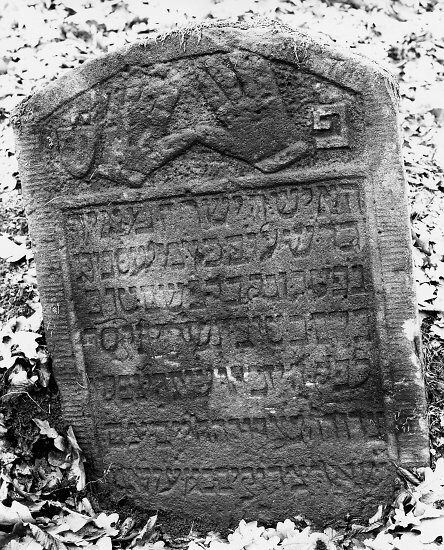 Henchen died in 1793, Meir in 1803. 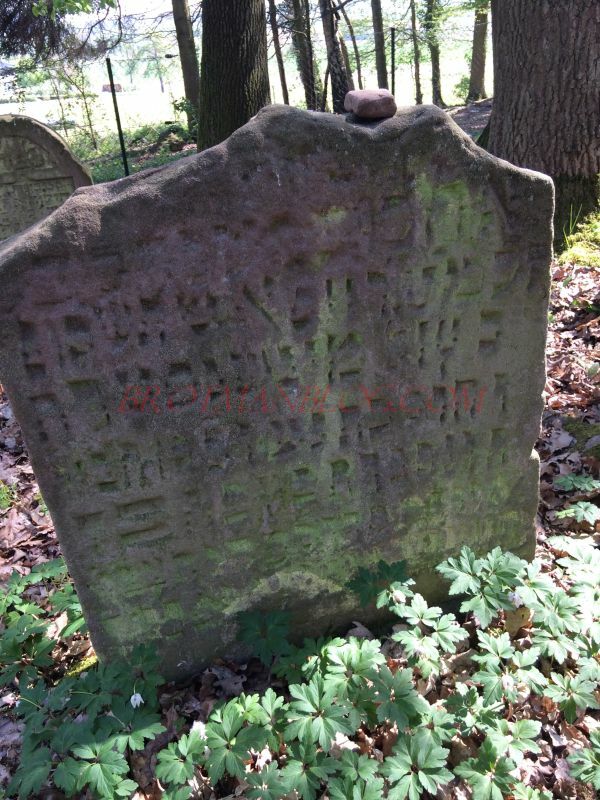 And this stone, which I photographed but could not read clearly at the site, is in fact the stone for my three-times great-grandfather, Scholum Katzenstein. 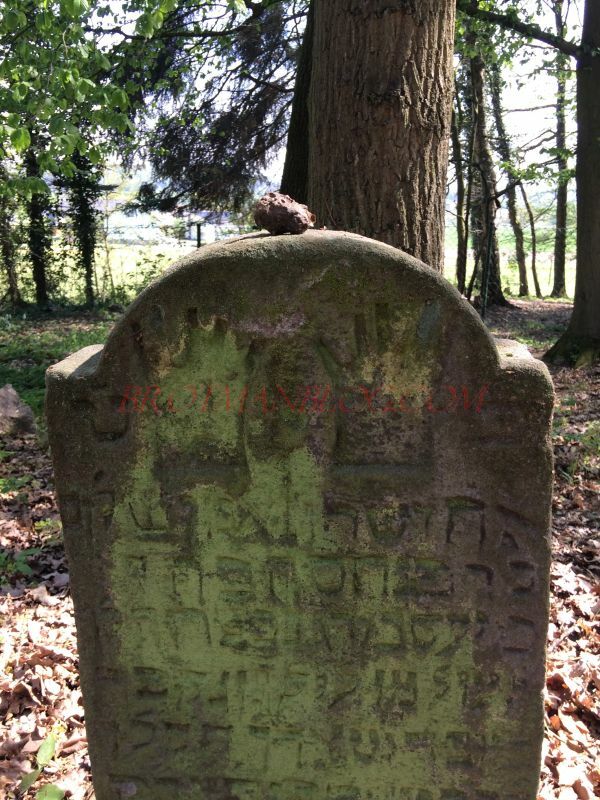 It is labeled on the LAGIS website as the stone for Abraham Schalum, son of Meir ha-Kohen, so I didn’t realize it at the time, but again, after checking with my resources at home, I now know that that was the Hebrew name used by Scholum Katzenstein and that that was in fact his stone. 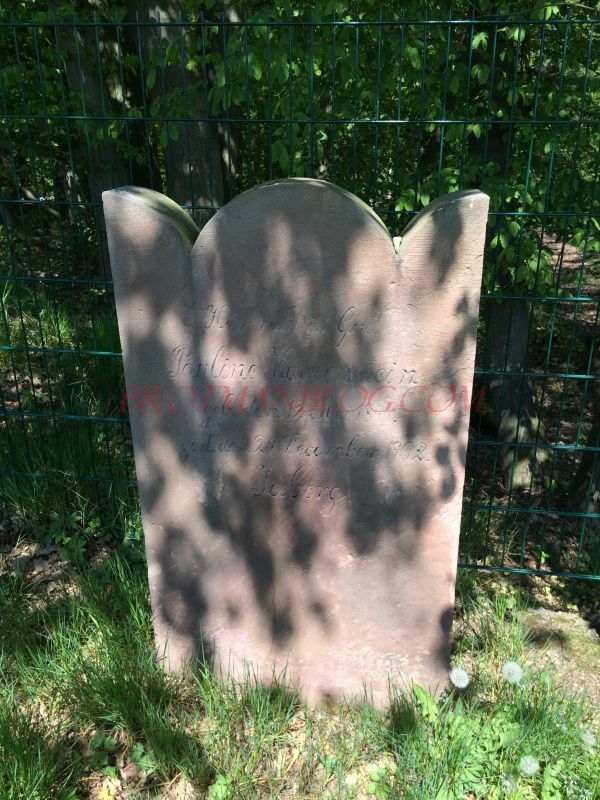 Perhaps the stone for his wife was nearby, but Hans-Peter had no sheet for a Breine Blumenfeld Katzenstein, and I couldn’t find one either at the LAGIS site. So I learned an important lesson: be really well prepared for cemetery visits. I feel extremely fortunate that I found the stones of my 5x great-grandparents, my 4x-great-grandmother, and my three-times great-grandfather. But I sure wish I’d known more about who was buried at Haarhausen and where they were buried before I even got to the cemetery. Am I kicking myself? Yes. I missed some important stones because I had not done a careful enough job of preparation. It’s too late now, and I am annoyed with myself, but I also learned a very important lesson. Do the hard work of preparation ahead of time because cemeteries are overwhelming, stones are hard to read, and time is limited. We left the cemetery and proceeded on to Jesberg, where the Katz and Katzenstein families lived from at least the early 19th century. Today there are about 2500 people living in Jesberg, making it about four times the size of Sielen but smaller than Breuna. A castle was built in Jesberg in the 13th century, and there was a Jewish community dating from the 17th century. 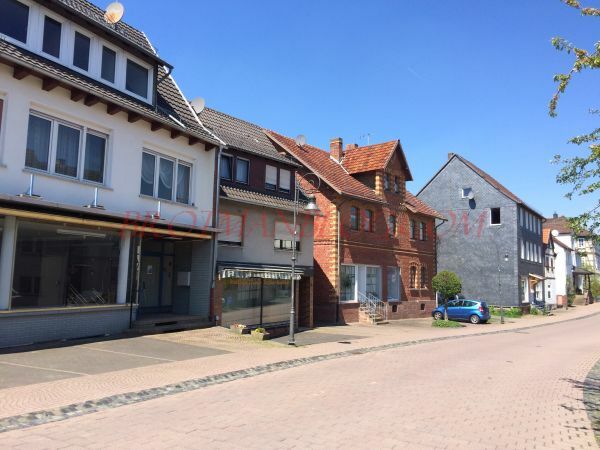 In 1905, the Jewish community of about 90 people made up over ten percent of the overall population of Jesberg; during the 19th century when my great-great-grandfather was born and raised, the Jewish population ranged from 55 people to 73 people, according to Alemannia-Judaica. A synagogue was built in 1832, and there was a mikveh, a Jewish school, and eventually a cemetery. 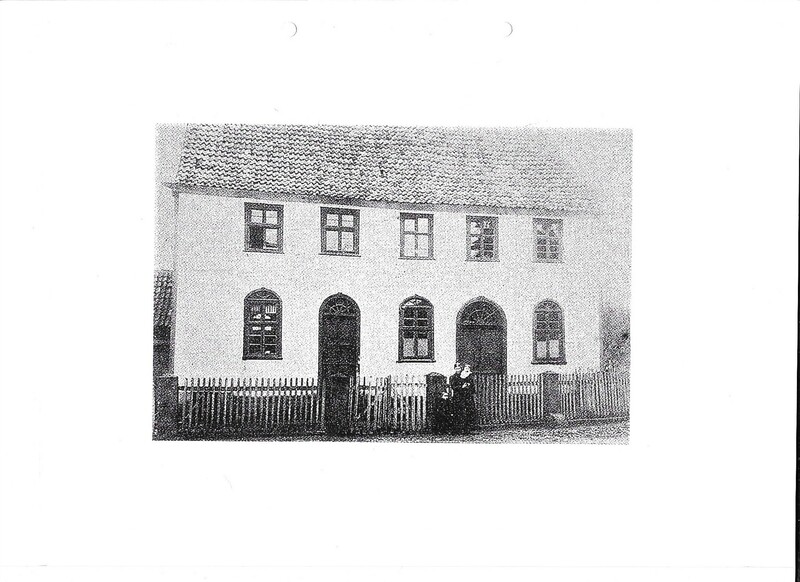 In 1933 when many members of my Katz family were still living there, there were still more than fifty Jews in Jesberg. 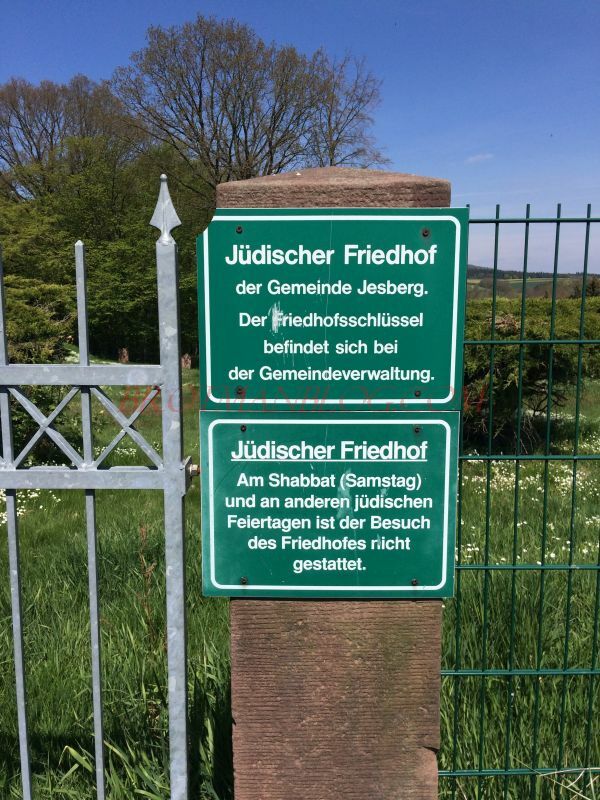 Today there are no Jews in Jesberg. Helping us in touring Jesberg along with Hans-Peter was Mrs. Ochs, who is another volunteer in the research of the Jewish history of the area and who works with Barbara Greve, who was out of town. 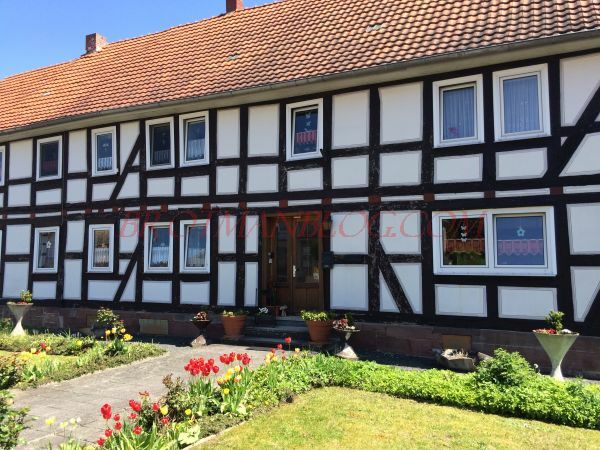 Mrs. Ochs lives in Jesberg and was, like all the others, very warm, friendly, and helpful. We first drove out to the Jesberg cemetery, which did not open until about 1900 and which only has about twenty stones. 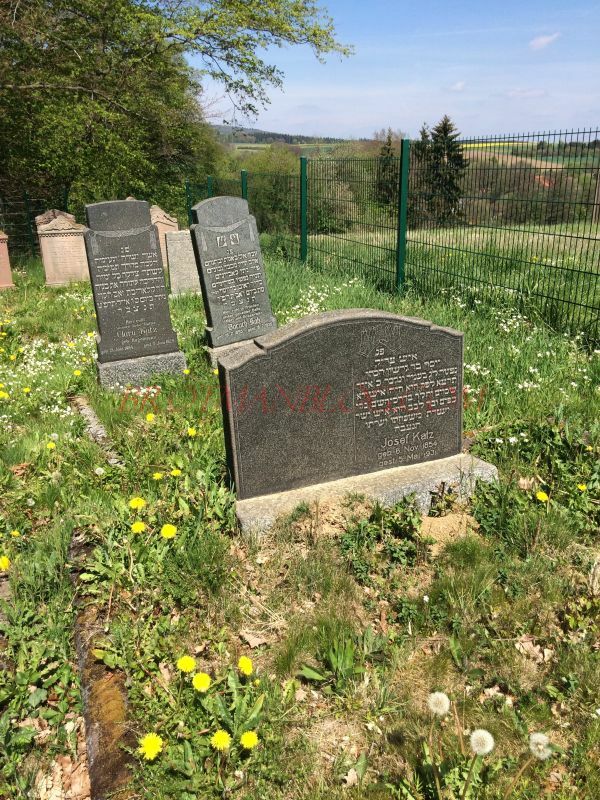 I knew that Meir Katz and his wife Sprinzchen Jungenheim were buried there, the parents of Jake, Aron, Ike, Regina, and Karl Katz, all of whom came to the US and settled in Oklahoma, some in the 19th century, others in the 1930s to escape the Nazis. 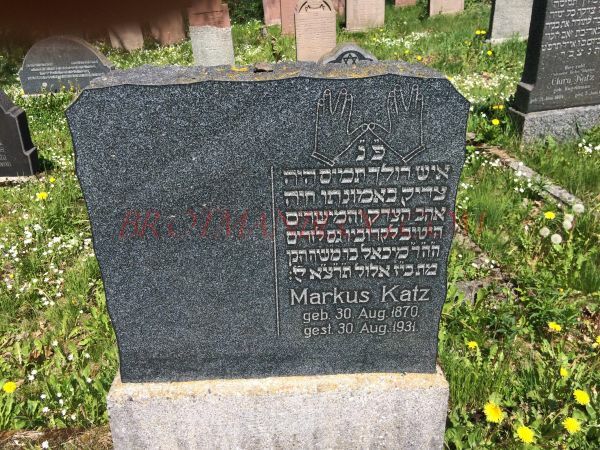 I had spoken to Karl Katz’s son Fred before we left for Germany, and he had asked me to look for his grandparents’ graves and told me how to find them in the cemetery. There were also a few stones where half of the stone was left blank, obviously reserved for a spouse. What had happened to their spouses? Had they left Germany and escaped safely or had they been killed in the Holocaust? I decided I would check. Markus Katz: He was the son of Moses Katz, as I wrote about here. His grandmother Rahel Katzenstein was the sister of my great-great-grandfather Gerson Katzenstein. Markus was married to Minna Wallach, also known as Nanny according to other records. As I had feared, she was murdered in the Holocaust, explaining the blank side of this headstone. Another stone with a blank half was for Josef Katz. He was quite distantly related to me, a third cousin, three times removed. According to David Baron’s research, Josef was married to Bertha Lowenstein, daughter of Simon Lowenstein and Esther Stern, and she was born in Fronhausen, Germany in 1870. 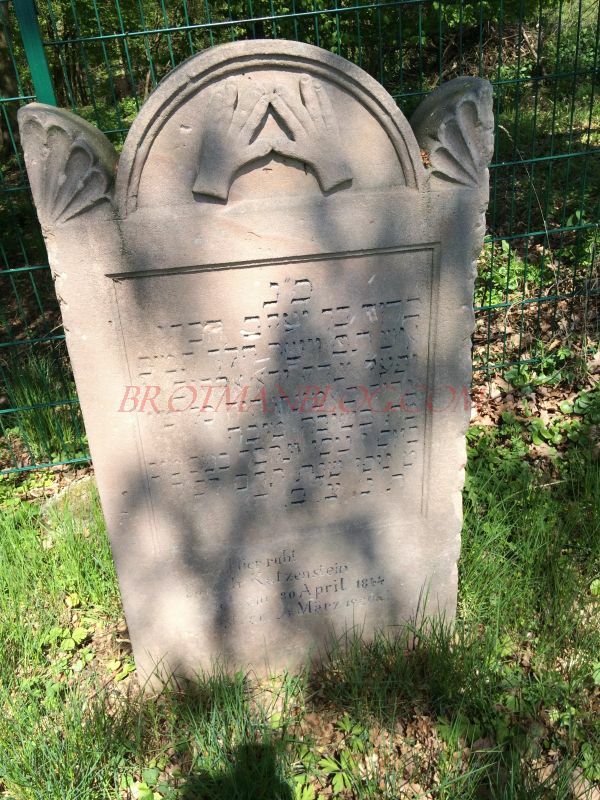 I have not yet found any information about Bertha’s death so cannot say why the other half of Josef’s gravestone is blank. Perhaps she escaped the Holocaust, though her son Siegfried did not survive, so I doubt she did either. I will keep looking. The third stone with a blank half was for someone named Moses Schloss. As far as I know, he was not a relative of mine, but I still wanted to know what had happened to his wife. According to Yad Vashem, his wife was Lisette Gans Schloss, and she died at Theriesenstadt on October 14, 1942. So it appears my hunch was right. At least two of the three blank stones were for victims of the Holocaust. 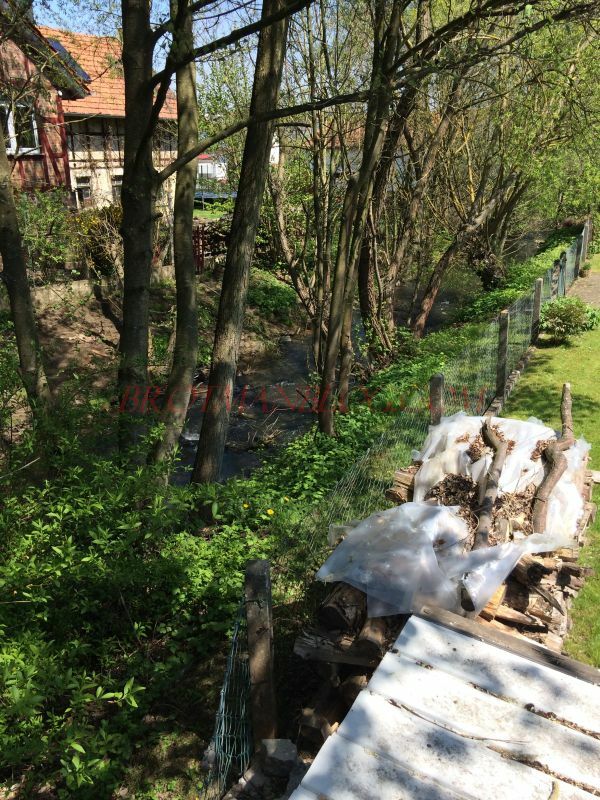 After visiting the cemetery, we returned to Jesberg, where Mrs. Ochs showed us the former synagogue and pointed out the brook that ran behind it, feeding what was probably once a mikveh. 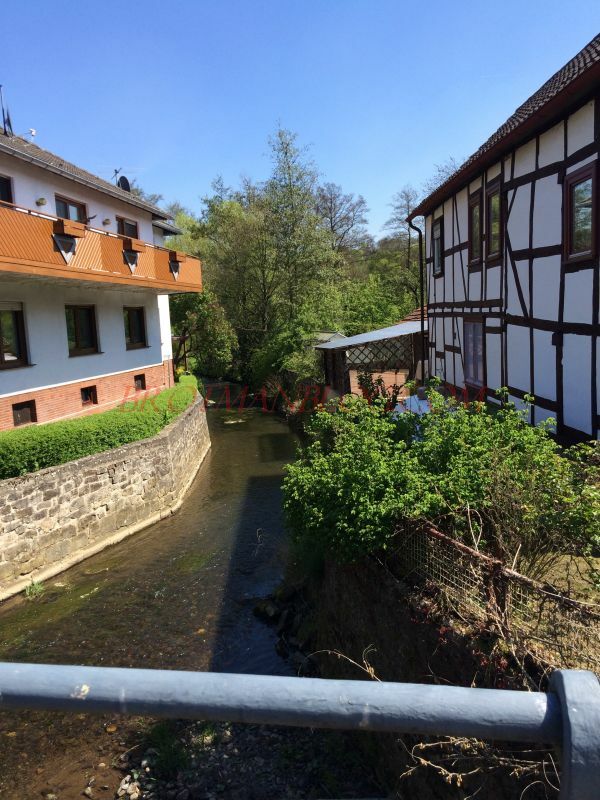 I could imagine the carefree life that my great-great-grandfather Gerson Katzenstein and his many cousins had in Jesberg, running through the quiet streets and playing in the brook. The town is probably not that much different today in appearances, other than the cars and paved roads. We also walked down Bahnhofstrasse, the street where Fred Katz had lived as a young boy before escaping with his parents to Oklahoma in December 1938. 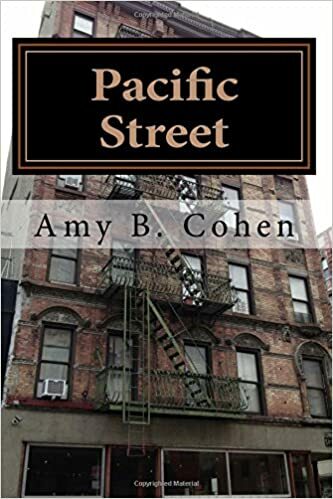 Fred had told me the house number, so I was able to find the house where he had lived with his parents, Karl Katz and Jettchen Oppenheimer, his brothers Walter and Max, his uncle Aron and his wife Sarah, and their sons Jack and Julius. More on Fred and his life in Jesberg in a later post. 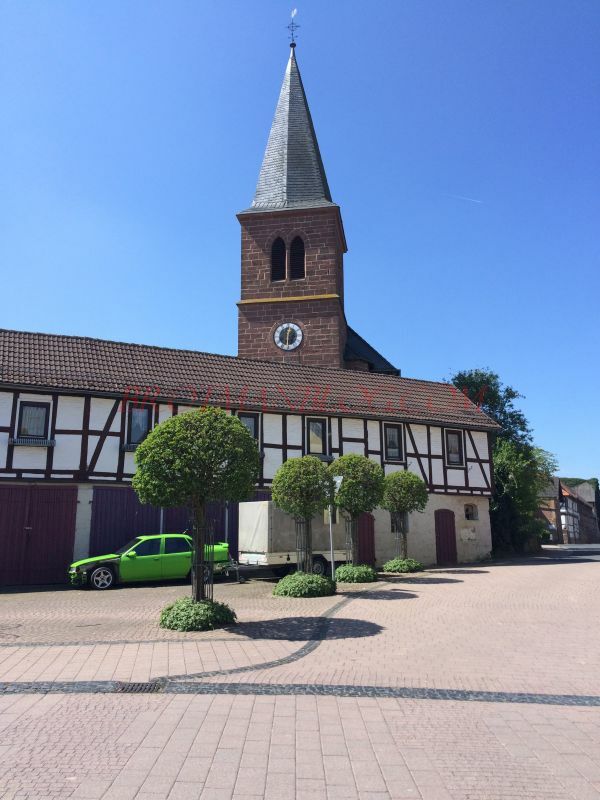 We then all went to lunch in a nearby town (there was no place to eat—not even a bakery—in Jesberg), and then Harvey and I said another difficult goodbye to Hans-Peter and Mrs. Ochs and to the Kassel region. Our days in the Kassel region far exceeded my expectations. The friends we made and the places we saw will stay with me forever. Yes, I wish I had better prepared for the cemetery visits, but overall I have no regrets and am so thankful that I got to visit the homes of my Hamberg, Goldschmidt, Schoenthal, and Katzenstein ancestors. I am particularly thankful to Ernst Klein, Julia Drinnenberg, Hans-Peter Klein, Barbara Greve, and Mrs. Ochs for all their hard work and dedication, and, of course, especially to Harvey for being a willing and helpful participant in the hunt for stones in so many cemeteries. 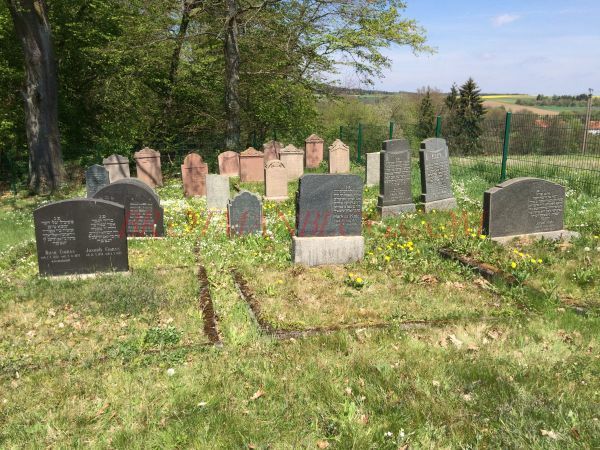 This entry was posted in Genealogy, Germany, Germany trip 2017, Holocaust, Jesberg, Katzenstein, Travel and tagged Cemetery, genealogy, Germany, Jesberg, Katz, katzenstein by Amy. Bookmark the permalink. Wow! How exciting to see the house where Uncle Walter grew up! And the town he grew up in. Thank you for the photos! Right! Of course—sometimes I do lose track of all the connections. So many cousins—all so wonderful. As it is said, we are all connected. That is for sure—in so many ways! 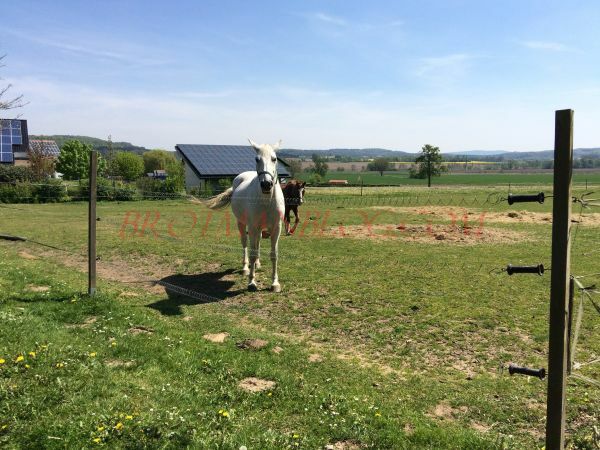 Nice blog, however, your watermarks are extremely annoying (and dishonor your family). I’ve had photos stolen and so that’s the price we all pay for those who don’t respect the property of others. And to say they dishonor my family is ridiculous. I absolutely agree with Lynn. In fact, your interest and research, and your visiting the graves, does nothing but greatly honor your family! Thank you so much! I really appreciate the support. There is nothing dishonorable about the watermarks! Thank you, Lynn. I appreciate the support—very much. Thanks for the advice. 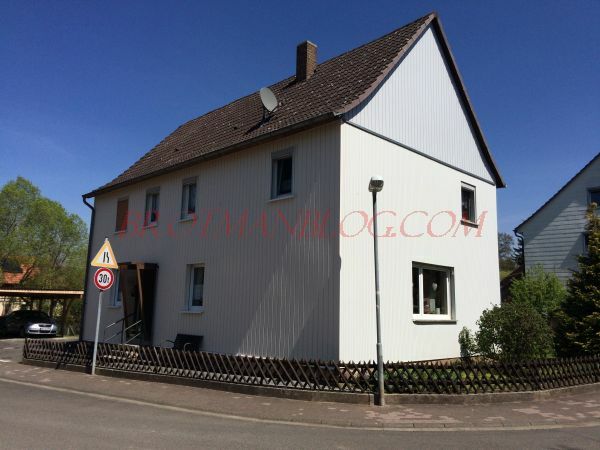 We will visit (from northern California) nearby Roth (south of Marburg) and also Munster (near Darmstadt) in early September. Any other suggestions? Do you have guides? If you need some contact information, let me know. Germany was a lot less centralized in former centuries; and is even today less so than many other countries. Most of our universities are State U’s (free tuition!!) so are the research institutes. The first main topic were the Jewish cemeteries. so we have so many good photos!! LAGIS is only for Hessen, there are other sites for other parts of Germany. Thank you as always, Dorothee! Very interesting, what do the hands on the grave stones mean? This may be ignorance on my part, and possibly others, so I am going to ask the question. What significance do the hands have on the stones? I know I could have googled it but thought others may have the same question and would hesitate to ask. I’m off to read it. Thank you! And someone else did! If you were ever a Star Trek fan and remember Mr. Spock’s hand sign, Leonard Nimoy was inspired by the Cohanim symbol! When I read that in the post you linked I knew I’d already looked into it. I think you may have already told me and I’d forgotten. Your entire trip was so priceless. Tracing your family back so far is incredible!! You’re too hard on yourself. The amount of work to prepare for a trip like you took was so much. You couldn’t do everything and you couldn’t think ahead of everything. You didn’t even know for sure what you would encounter. This is a downer comment after such a beautiful post, but I want to know what you think or if you heard anything during your trip. How do you think a cemetery like this and with its records to boot survived WWII? How was it not destroyed by either the Nazi government or the locals? Thanks for the pep talk, Luanne! I needed that. You’re right—I spent a great deal of time planning out every part of this trip (except the flight—Harvey did that). But this was something that was not that hard to do IF I had thought of it. 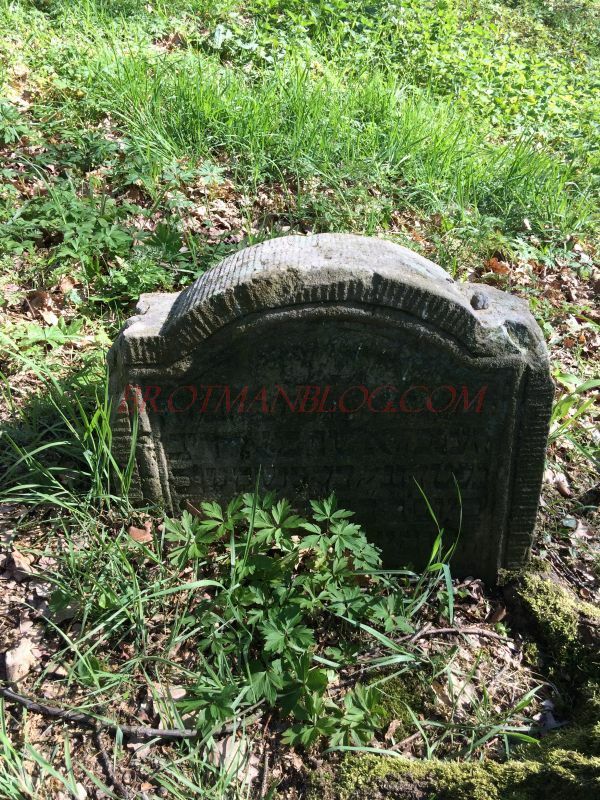 I just thought—cemeteries will be small, stones will be legible, and I have a guide. Sigh. As for why these survived? I think it was pure luck. Most of the cemeteries we saw are nowhere near the towns where people lived. 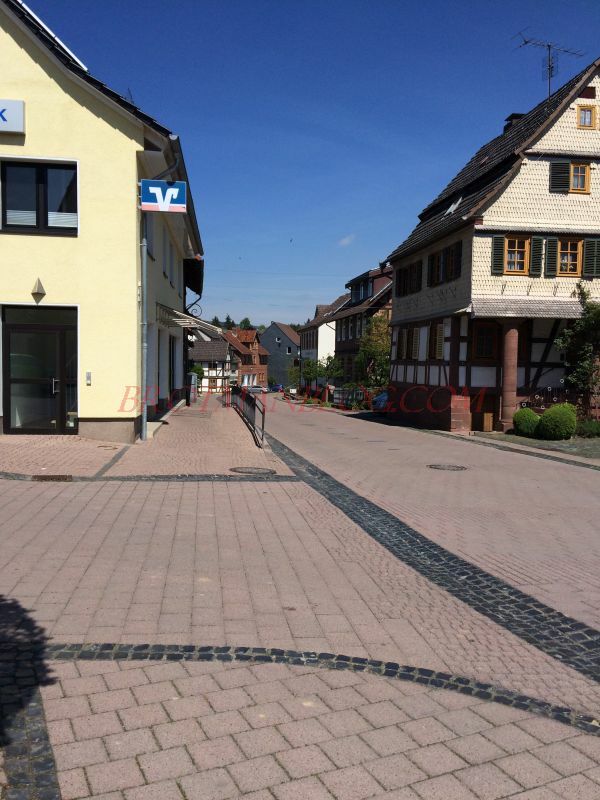 And maybe I am naive, but I don’t think most of the locals in these towns were fanatic Nazis. They did what they had to do to survive and they cooperated, but I don’t know that they were interested in being destructive. Maybe that’s wrong, but every town we visited we heard that before Hitler, Jews and Christians lived in peace and as friends in these small towns. Some cemeteries in Germany were destroyed, depending of the intensity of the local Nazi ideology. But many were actually spared because some non-Jews saw to it. And then most men were soldiers and “fighting” and murdering elsewhere. The overall destruction of cemeteries in occupied Poland and the Baltics was more intense, probably also in the Soviet Republics which were occupied. Thanks, Dorothee. That’s really important for people to know. Ha! I was going to ask about the hands as well. 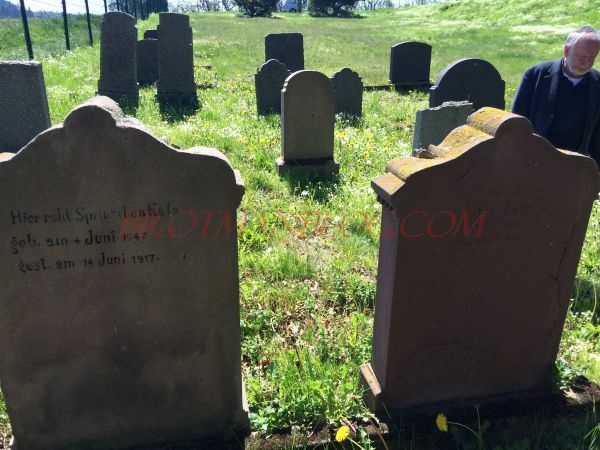 For such a small cemetery in Jesberg, there sure are a lot of your ancestors there. The stones that are half blank is a painful reminder of how the Holocaust tore families apart. I think in these small towns where there were about 50-60 Jews, most were somehow related whether by blood or marriage. I guess I felt like an hour more preparation for each cemetery would have helped. But overall I am thrilled with how the trip went. As for watermarking, I use irfanview, free software that works well and is easy to use. It also compresses the photos to save space. Cool post! And thanksforthe tip me being really well-prepared. was also thinking that digital photography is indeed a blessing for travelling genealogists! Yes, having an iPhone to take photos was great—easy to edit, easy to share, easy to take! And thank you! How fortunate you were to have this opportunity to travel and pay your respects at your ancestors’graves. And you raise some important points to consider before visiting a cemetery. I’m headed to one tomorrow so perfect timing. I do feel very fortunate. And I hope your cemetery visit goes well! Thanks! Great post Amy. It is hard to prepare for everything especially on such a long trip with so many stops. 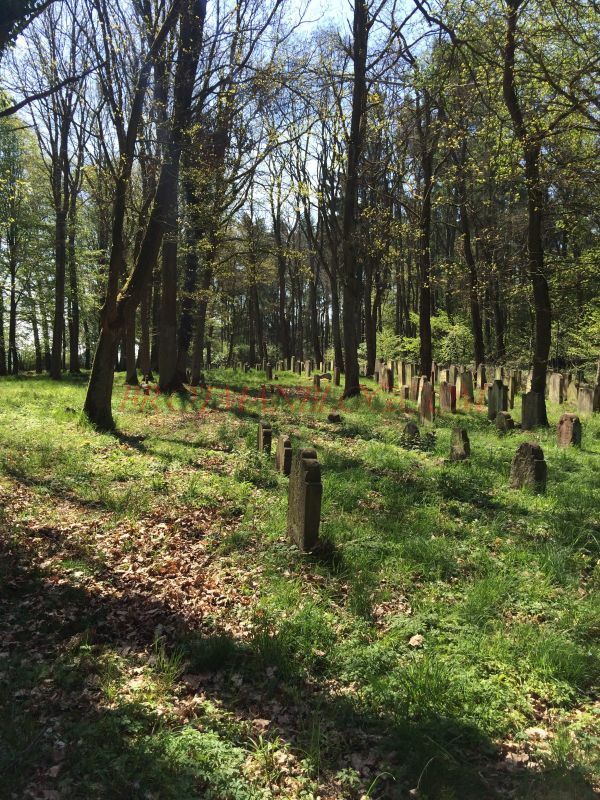 I’m so happy for you that you found the headstones of your 5th great grandparents (even if you thought they were for someone else at the time) – that is really incredible! What an experience you had. I appreciate you taking the time to notice and then research the blank stones. I wonder if you could have an inscription added honoring the spouses who were not able to be buried where they had planned to be. Thank you for sharing. Thanks, Amberly. It was quite an experience. As for the blank stones, I am not sure what could be done since the wives are not buried there. In the case of Markus Katz, he had children who survived him and his wife. I’d assume they would have done something if they thought it was appropriate.